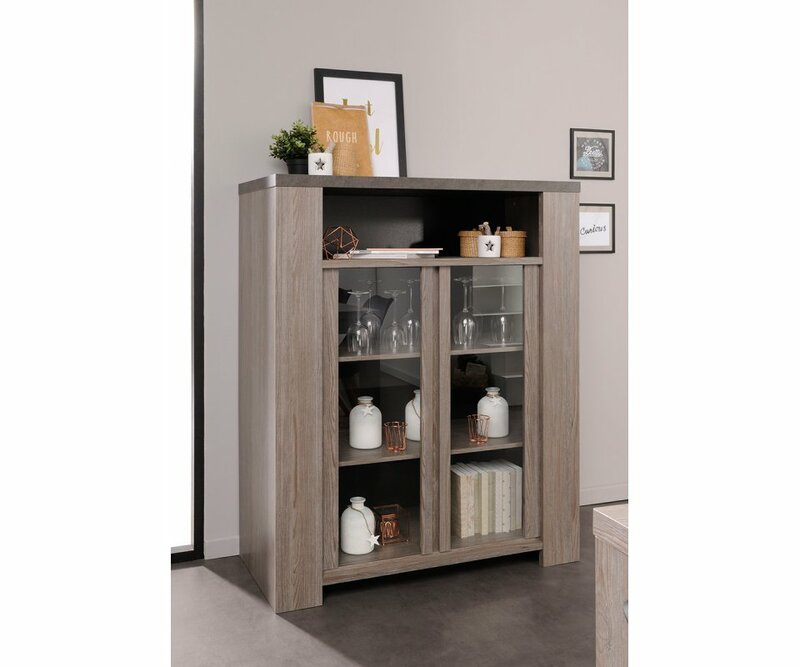 CONTEMPORARY DISPLAY CABINET: The simple lines and neutral color palette of this cabinet add a touch of nature that is a perfect setting for displaying all your favorite things! 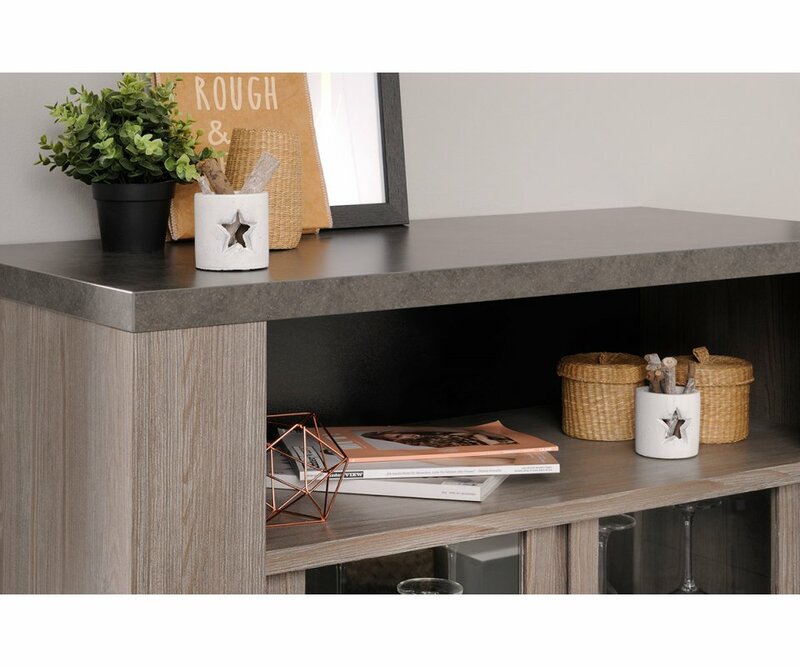 OPEN UPPER SHELF: A wide shelf below the top surface provides a display area for serving pieces, collectibles, plants, or home décor pieces. 3 ENCLOSED SHELVES: There’s plenty of room for all your fine china or everyday dishes on three wide enclosed shelves below the open shelf. GLASS DOORS: Tempered glass doors add elegance and protection, keeping your dishes clean and dust-free, and creating an attractive display for your dining area. 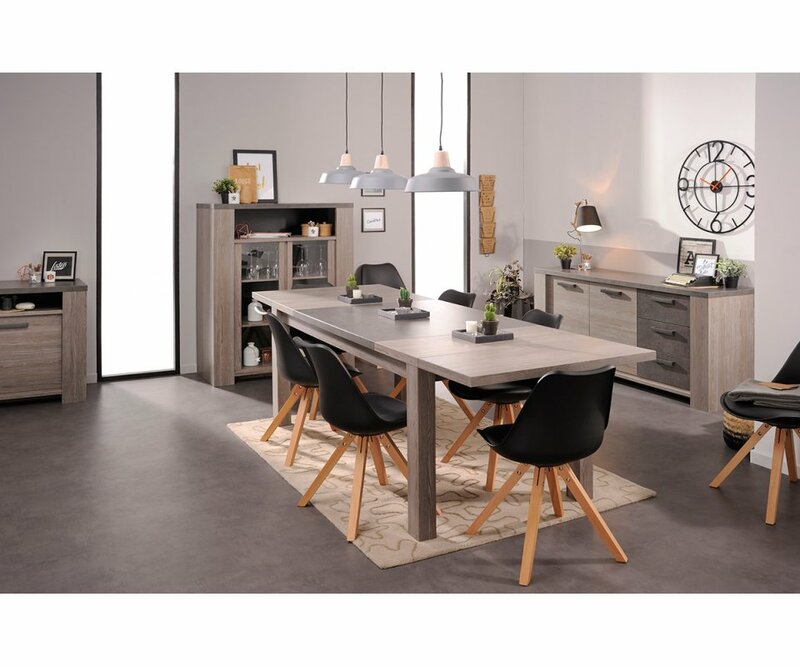 2-TONE FINISH: Light Clay Oak woodgrain veneer is accented by Dark Concrete veneer, creating a wood and stone combination that coordinates with most home décor styles and color schemes. 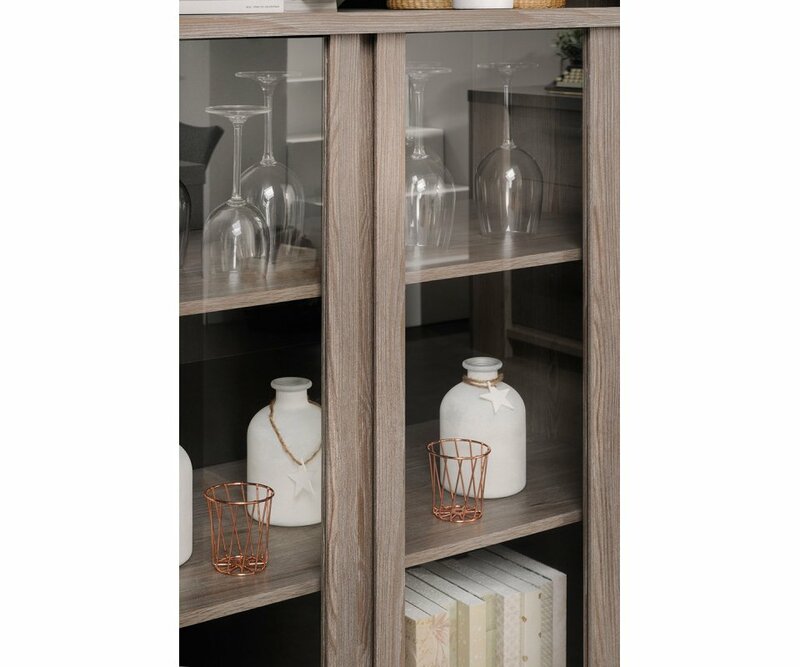 RoomSmart’s Gossip Dishes Cabinet provides a beautiful display piece, and practical storage solution for your dining area. 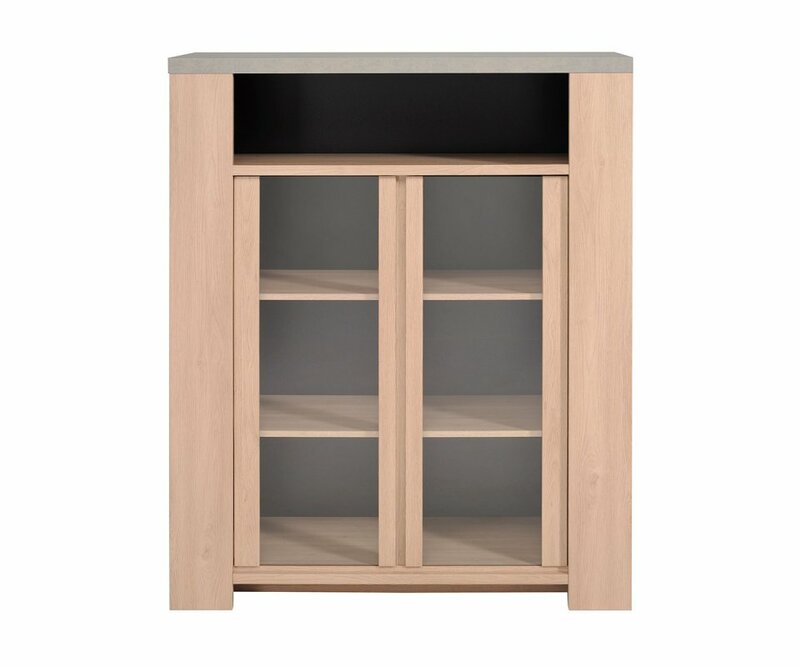 The cabinet is finished in a natural Clay Oak woodgrain veneer, and topped with a Dark Concrete veneer, creating a wood and stone effect that easily coordinates with home contemporary and traditional home décor, and with most color schemes. The veneer is designed to withstand daily use, and resists stains, scratches, water ring damage, and fading from UV rays. 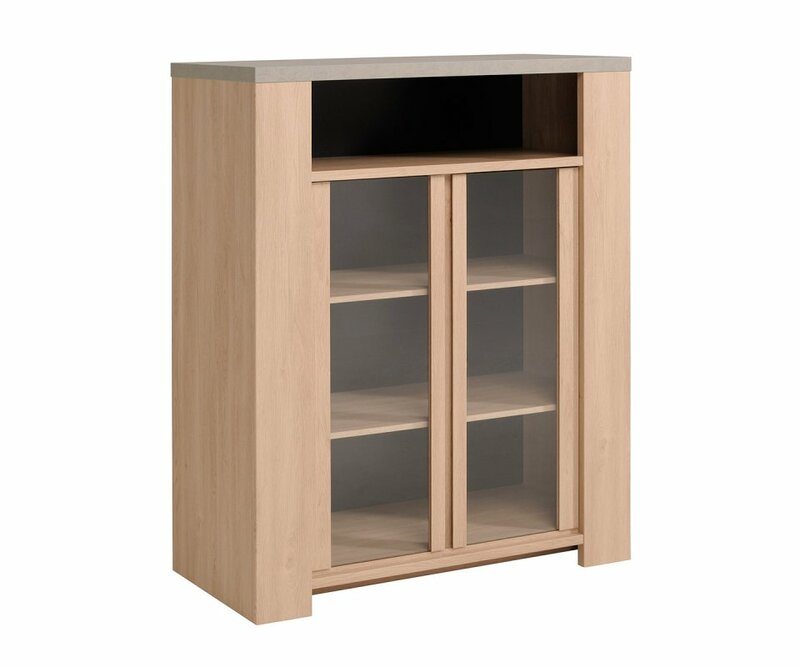 The cabinet has an open shelf for displaying home décor, wine glasses, or collectibles, while two glass doors enclose three wide shelves for your everyday dishes or fine china. 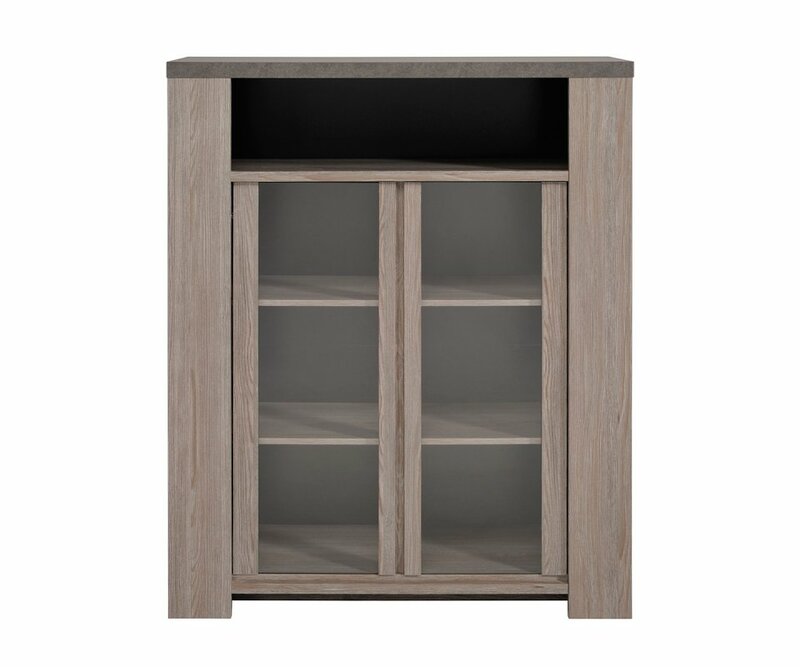 You will love the contemporary look and natural color palette of the Gossip Dishes Cabinet! 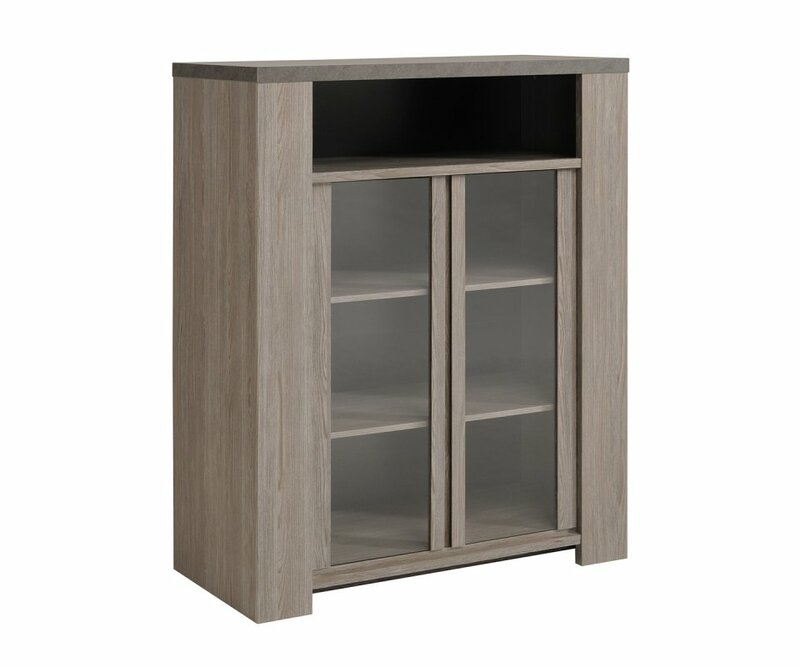 NATURAL STYLE: This solid table with corner-fitted legs has a two-tone stone and wood style that adds a natural element to your living room!2-TONE FINISH: A Clay Oak foil woodgrain veneer table, with a Dark Concrete veneer top, is a neutral color combination that coordinates with most room co.. CONTEMPORARY STYLE: The large Gossip sideboard combines an elegant buffet surface and lots of storage space for your dining area, with natural on-trend color palette that coordinates with most modern home décor.TWO-TONE VENEERS: Light Clay Oak woodgrain frame and Dark Concrete counter and dra..
2-TONE FINISH: Light Clay Oak woodgrain foil veneer combines with Dark Concrete veneer to create a natural element that blends with traditional and contemporary homes.OPEN SHELF: Below the top surface is a full-length open shelf for displaying home décor and storing trays and serving platters..
TWO-TONE FINISH: Light, natural Clay Oak and Dark Concrete veneers combine to create a wood and stone effect that is an attractive addition to most home décor styles.OPEN SHELVES: Below the top surface on one side are two shelves for TV media equipment, with opening in the back for cords to c..
ECLECTIC STYLE: The natural color palette and sleek lines of the Gossip table contribute to the contemporary style that blends with most traditional and modern home interiors.TWO-TONE COLOR: Light Clay Oak woodgrain veneer and Dark Concrete gray veneer are on-trend with today’s favorite color..